Lonni Sue Johnson is an artist, musician and pilot when she contracts an encephalitis infection which destroys her hippocampus, the locus of memory in the brain. You might even recognize some of her covers for The New Yorker magazine. I didn’t know I was interested in memory until I read this book. You will read what neuroscientists are learning about the functioning of our extremely complex brains. It’s pretty fascinating. I also did not fully appreciate profound amnesia. Yes, you don’t remember the past, but you also are unable to form new memories, which means every day and every person is always brand new to you. Wow. Lonni Sue is a very positive and happy person, which makes reading her story surprisingly uplifting. As I write more blogs, I come to appreciate more about the writing process and authors. Lemonick’s work has been for Scientific American and National Geographic, and he has written more than 50 science articles for Time. You will learn more science than you might expect in this biography, and less human interest. I would have liked more heart ... more about Lonni Sue and her life. Lemonick does a good job of this, just not great. He is a scientist before a humanist. That being said, if your interest is at all piqued, I recommend The Perpetual Now. This science is presented in lay terms, and tied together well. I also put Eternal Sunshine of the Spotless Mind on my Netflix list as a result of reading this book. Have you seen this movie? 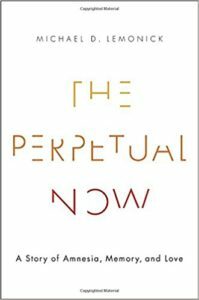 The Perpetual Now is a Real Simple recommendation. Eternal Sunshine of the Spotless Mind is one of the best movies AND screenplays of the 21st century. Kate Winslet deservedly won the Best Actress Oscar too. I loved Eternal Sunshine of the Spotless mind!